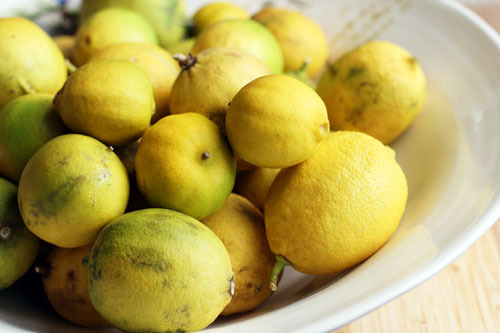 Call for Recipes: When Life Gives You Lemons, Make Lemonade and Lots of Other Stuff, Too. I’ve been totally neglecting my blog this week. I’ve been sick. Yep, I’m making excuses. Everyone feel sorry for me now. No, really, DON’T. But I do miss you all! It’s been a little while since our last Call for Recipes, so I think it’s time for another! And, today’s theme is LEMONS! Our neighbors graciously gave us a big bag of lemons from their tree in Palm Desert. In addition to the gifted lemons, my own lemon tree is about to burst forth with fruit. I have a feeling the Maynards are going to have a lot of lemons in our near future. To save my family from being served only lemons on Thanksgiving, I need you to share your best lemon recipes! I already put a call out for ideas on Facebook, which was incredibly helpful. However, it made me think we need a place to share actual recipes with one another. So, here we are! 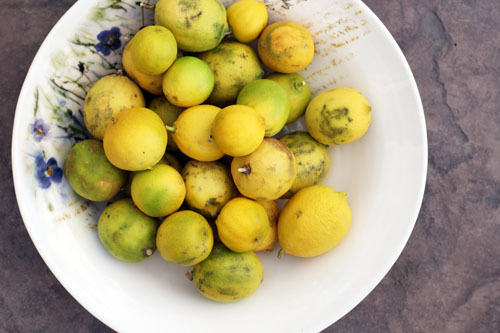 Share your favorite lemon recipes! Savory, sweet, cleaning “recipes,” anything! Feel free to type out the recipes or just share links, anything is game! I’ll start with my delectable lemon bars. Now, your turn! A few weeks ago I went to a 1-day conference put on by Ladies Home Journal in New York. I learned some great stuff but, more importantly, I connected with people in person. That’s always the best part of an event! One of those people was Lisa Cain from Snack Girl. Lisa is great – I could talk to her for hours! Her blog is all about eating healthy food and she breaks down the nutritional content of all the recipes on her blog. Since you totally don’t get that from me, I thought it would be fun to share a bit of Lisa with you today with a guest post! Enjoy and be sure to check out her blog! Snack Girl posted this chili recipe with pumpkin last year and people are still talking about it. Yes, it was a hit. Why add pumpkin to your chili? It’s cheap, easy, and has 763% of your daily value of vitamin A in one cup (and only 83 calories). 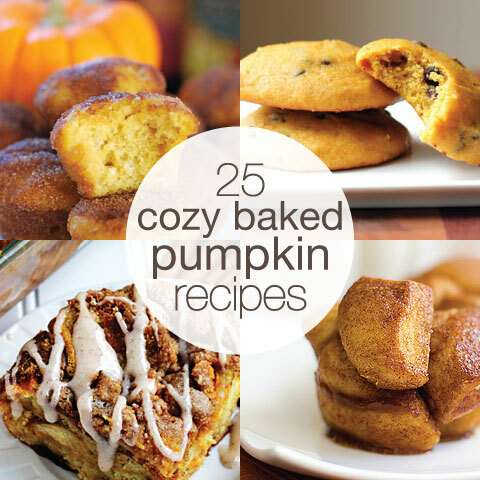 You can sneak a bunch of nutrition into food by adding pumpkin. After creating a no-bake pumpkin cookie and a pumpkin smoothie, I decided to try a savory dish. 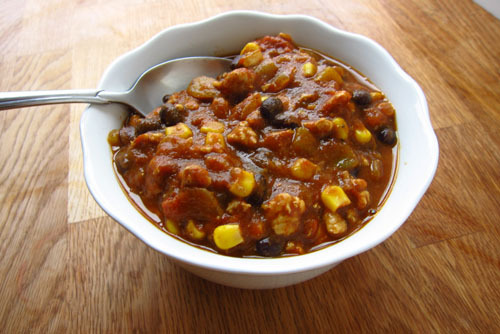 This chili recipe below is the healthiest chili (with meat) that I have ever made. It boasts 28% of your daily value of iron, 45% of your daily value of vitamin C, and 293% of your daily value of vitamin A per serving. This is like a nutritional “rock star” chili. I used ground turkey breast because it is low in saturated fat, and beans, corn, and tomatoes to up the vegetable content. I did think the flavor was nice, but missing the depth of a beef chili. I might sneak a wee bit of cheese on top of mine to make it taste a bit more luxurious. The pumpkin made it a great color and added a creaminess to the chili. As we greet fall, it is time to stock up on cans of nutritious pumpkin. In a large saucepan, heat oil and add onion. When onion has softened add turkey and cook until cooked through (should look white). Add the rest of the ingredients and taste to adjust seasonings. Simmer for 10 minutes and seve. 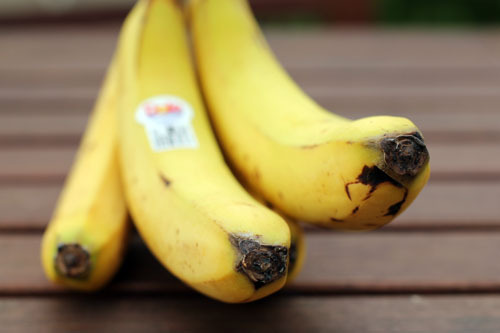 These bananas are going to be used in something out-of-this-world-delicious later today. Well, assuming all goes well it will be out-of-this-world-delicious. And, if all does in fact go well, you’ll be getting the recipe this week. Everyone cross fingers and toes! How is it time to plan another menu? SERIOUSLY. – Nate and I are going to the Stanford/USC football game. GO STANFORD! As always, I can’t wait to see what you’ve all got cooking for the week. Thank you for posting your menus! I love Chipotle. It’s delicious, they are working to have more sustainable food production practices, and I can feed my family of five relatively healthy food for less than what we spend at McDonald’s and other fast food restaurants. I don’t know how they do it, but it’s great and I happily partake! 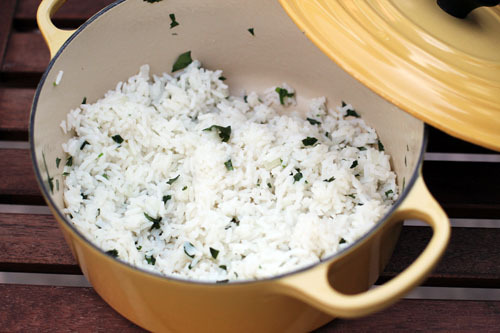 One of the best parts of Chipotle is the white cilantro-lime rice (yeah, yeah, I skip the brown rice). I love it. It’s simple, it’s so good, and it’s a great base for a burrito. Well, I finally figured out how to make it at home and I am SO excited! It’s really simple and oh-so-tasty. I’ve made it twice already this week! Heat a swig of olive oil in a saucepan over medium heat. Add chopped onion and cook until soft. 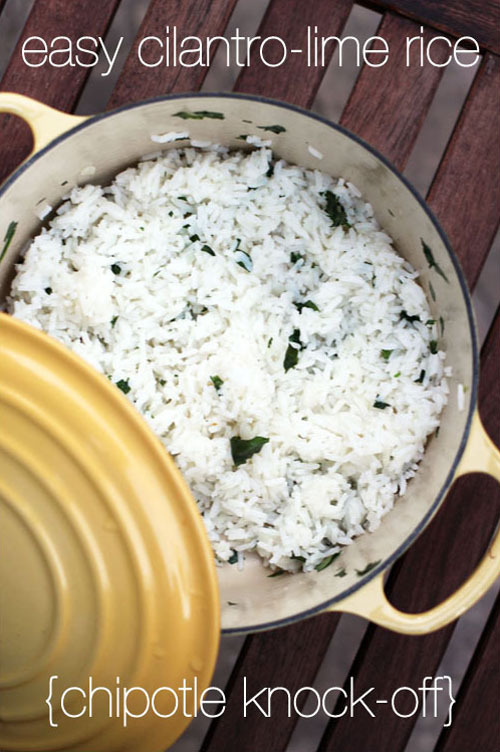 Add jasmine rice and fry it up for a few minutes in the pan. Add 2 cups of water and the salt, raise heat and bring to a boil. Once boiling, reduce heat to a simmer (low) and cover. Cook for 20 minutes, stirring the rice halfway through cooking time. Remove from heat, add the chopped cilantro and lime juice and mix well. Props to Ari, my Mexican neighbor who taught me how to cook good, basic Mexican rice, from which I derived this recipe. I don’t use my crock pot nearly enough. I don’t know why, I just sort of forget it’s there. But I should because it really is pretty awesome. The recipes usually only take a few minutes to prepare and normally involve simply dumping a few ingredients into the slow cooker. Then you walk away and forget about the food until dinner rolls around. Again, why don’t I do this more often?! I recently had the chance to try one of Campbell’s new Dinner Sauces. I could choose between a skillet sauce or a slow cooker sauce. I decided to pull the crock post out of the cabinet above the fridge and let it do its job! We picked the Sweet Korean BBQ dinner sauce to try and had it for dinner last night. Dinner prep was SO easy. The BBQ beef was simple to prepare, and when dinnertime rolled around, it only took me a few minutes to pull everything together. The kids loved the BBQ beef served over rice with a veggie on the side. They all had seconds, thirds, fourths – I’m not exaggerating! Nate and I went with the package’s serving suggestion of eating the BBQ beef as tacos. SO GOOD. I can’t tell you how happy I am there are leftovers for my lunch today! I rarely buy pre-made sauces and dinners because, well, I usually don’t think they are that good. But this Sweet Korean BBQ was awesome and I’m really happy we tried it! Place chuck roast in crock pot and pour Sweet Korean BBQ sauce over the meat. Turn crock pot on low and cook for 7-8 hours. Remove meat from crock pot. Cut up or shred the meat. 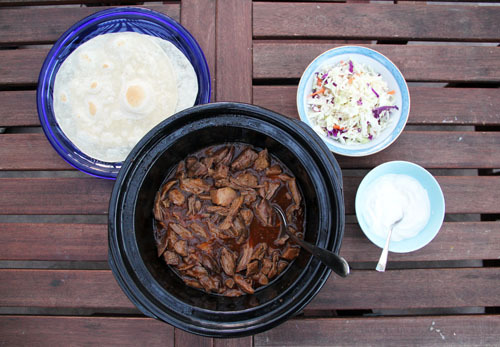 Return meat to slow cooker and mix with the sauce. 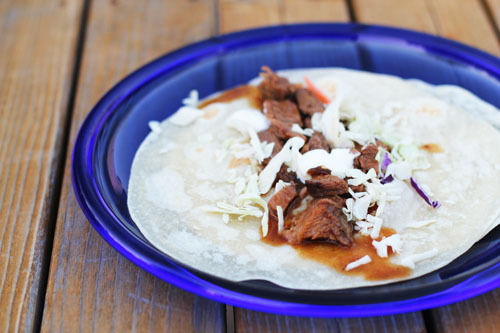 Heat flour tortillas then top with beef, coleslaw, sour cream dollops and a bit of hot sauce if you want some heat. Wrap like a burrito if your tortilla is bigger or fold like a taco for smaller tortillas. This is a sponsored post through DailyBuzz and is brought to you by Campbell’s Dinner Sauces, weekend-worthy dinners with only weekday-level effort needed! All opinions are my own. Learn more at http://www.campbellsauces.com/. 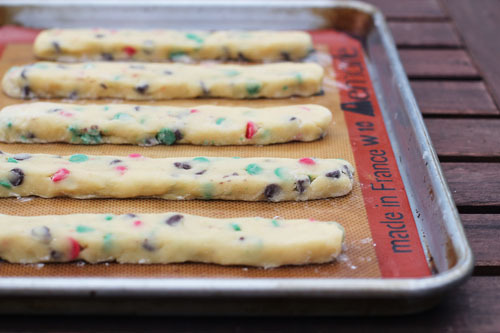 Mini Homemade Holiday Biscotti for Handmade Holidays Bake, Craft, Sew + An Amazing Giveaway! I think it’s time that I share the biscotti I teased you with yesterday! This year I’m taking part in the Handmade Holidays Bake, Craft, Sew-Along with Rachel, Cindy and Kelly. They are some pretty awesome ladies and every year they organize 30 days of blog posts on their blogs written by a whole gaggle of great bloggers sharing homemade holiday gift ideas that you can bake, craft and sew! It’s pretty sweet (pun intended)! My post went up today on Rachel’s blog A Southern Fairytale. 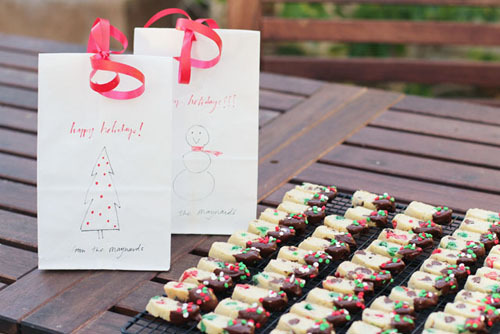 I share a recipe for mini homemade holiday biscotti along with a super easy and inexpensive holiday treat packaging idea. Be sure to jump on over there to check it out! A $100 design credit from Design Chicky – to help you create custom recipes cards, a Facebook page, or any of her other services! Good luck and remember you can enter once a day! Be sure to visit A Southern Fairytale, Skip To My Lou, and According To Kelly every day this month for a new handmade gift ideas! I just spent the morning making holiday-themed biscotti. And, no, it’s not because I am super prepared and excited for the holidays to come. It’s because I’ll be participating in Handmade Holidays with a group of lovely bloggers this month. In fact, my post will go up tomorrow, so stay tuned! Last week was INSANE and it was totally Halloween’s fault. While it was all really fun, I am glad it’s over and hopefully this week will be a little calmer. – I don’t know! Maybe waffles, maybe more leftovers if we have them…we’ll see! You know the drill! Please post your wonderful menus – whether they are fancy or not, we want to see them! Happy Friday! Hope you are all recovering from any sugar-induced Halloween comas! I think it’s safe to say we have officially entered the holiday season. Before things get too crazy and the giving season is in full swing, I wanted to share two meaningful ways you could give back and help out some folks in need. First, a story close to home. 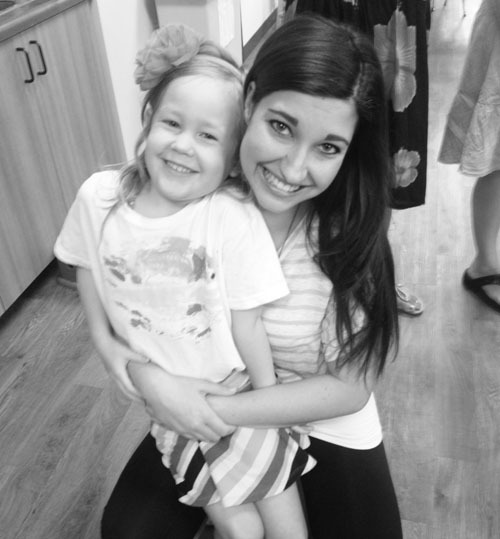 This past spring Anna’s wonderful preschool teacher Mandy gave birth to her first baby. She and her young husband were so blessed to be given this miracle baby – at just 23, Mandy was a cancer survivor and they thought they may never have children. Everyone was ecstatic for this beautiful young family with their baby’s safe arrival! Then, just weeks after the baby was born, they discovered that Mandy’s husband Ryan had a rare and aggressive form of cancer. They are both in their 20s and it breaks my heart whenever I think about what they are going through. Their faith and positivity have been truly inspiring as I’ve read their Facebook updates, but they are definitely going through some difficult times right now. I wanted to share a link to a fundraising page for their family, in case you have even $5 to share with them. I rarely write about or share these types of links because, well, I could share them all day every day, there are so many wonderful people out there who need support. But this story, well, it’s been on my mind a lot. Moving on, I love partnering up with ONE, Bono’s non-profit campaigning and advocacy organization that aims to end extreme poverty and preventable disease. ONE is not a fundraising organization but instead achieves change through advocacy. I think they’re awesome and love the people I’ve worked with on their team. They just announced a new partnership with Heifer International which is really exciting. 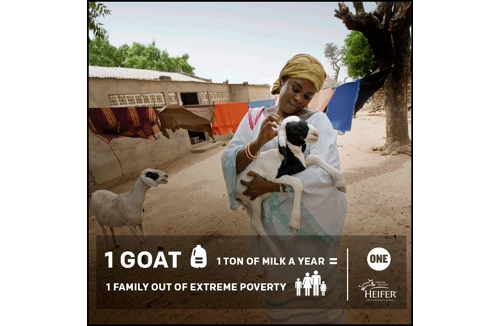 To find out more about the partnership and what Heifer does, click here! Plus, you can buy a goat. I know you’ve always wanted to buy a goat and that day has arrived, my friends. Looking forward to seeing what you all have to share this week! Have a great weekend!